Another break from the LAND OF DOOM today. You'll have to stand in the shadow of "the very gates of publishing" for one more day. On Thursday, I found myself giving the illustration keynote speech at the "Life, the Universe, and Everything" sci-fi/fantasy convention. The speaker was supposed to be the fantasy artist, James C. Christensen, but he couldn't make it. I was the last minute replacement. It turned out to be a lot of fun. Since I spoke, I was given a "Guest of Honor" badge, and have been put in a bunch of lectures and panels; four so far, with two more on Saturday. It's thrown my schedule way off. I haven't been commenting on the comments, and I didn't have time to put together today's LAND OF DOOM. Don't worry, though, I'll be back on track soon. Synopsis: TOP SECRET. It may, or may not have anything to do with stairs or cows. Before I started the picture book marathon posts, I was working on a concept for a book. This book (we'll call it "CODENAME: STAIR-COW" or just "STAIR-COW" for short) was something I was very excited about. In fact, I had trouble sleeping for a few nights--I was that hyped by it, I was pretty sure it was the best idea for a book I had ever had. I dummied out the first half of the book, I started work on a sample page, but then I hit the wall. I couldn't figure out where to go with it--it was too complex. I set it aside and started work on the marathon, hoping for some inspiration to strike. Tonight, when I was trying to figure out book#13, inspiration struck. IT STRUCK BABY! STAIR-COW is go! I can't tell you anything about this book, I have to keep it under wraps. I'll only share it here when it is safely under contract somewhere. Yeah, I think it's that good. Hey Nathan, I'm a fellow marathoner and I have a half-finished story about a stair cow too! I'm still stuck though. Good luck with yours! I grew up on a farm, and the slightly wild look in that cow's eye is spot-on! I hope this one sells! Anonymous, you are so funny. Not to interrupt your celebrating, but is it a bad thing if my custom avatar for sending in a picture of Calamity Jack hasn't come yet? p.s. Word Verification: bented. It made me laugh. No, no, no! You guys don't get it! This book isn't about a Stair Cow--I can't tell you what it's about. It's TOP SECRET! The Cow on the Stairs is just to throw you off the real story. It's a code name! I could have called it codename: BEAVER-SHOE or codename: TOE-HANDLE. That's not to say there might be a cow in the book, who may even go on some stairs--but the book's not called operation STAIR-COW--the secret project is referred to as STAIR-COW. Got it? Hey Indiana Jim--Ooh Codename: Starkeeper--that's a cool codename. 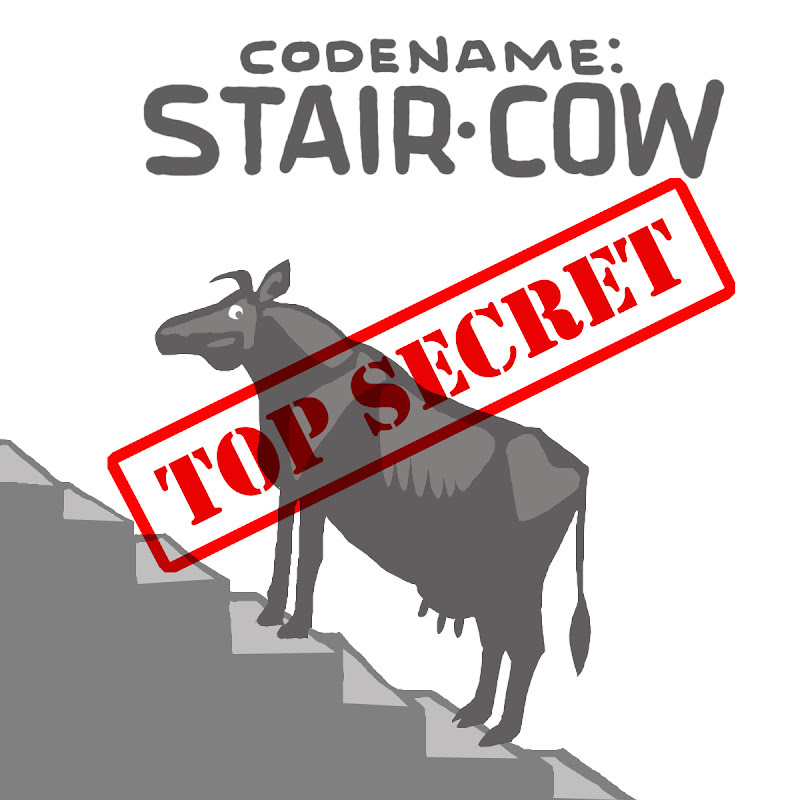 Way better than Codename: STAIR-COW. Wait a minute. Waaaaaaaaaaaait a minute! STAR-COW! I just had a flash inspiration of an epic space opera about a cow! Hold on, gotta write this all down...STAR-COW...Mission Log 48P19 "Our ship just touched down on Creamo Beta, home to a tribe of lactose intolerants..." Oh this is gold. GOLD!